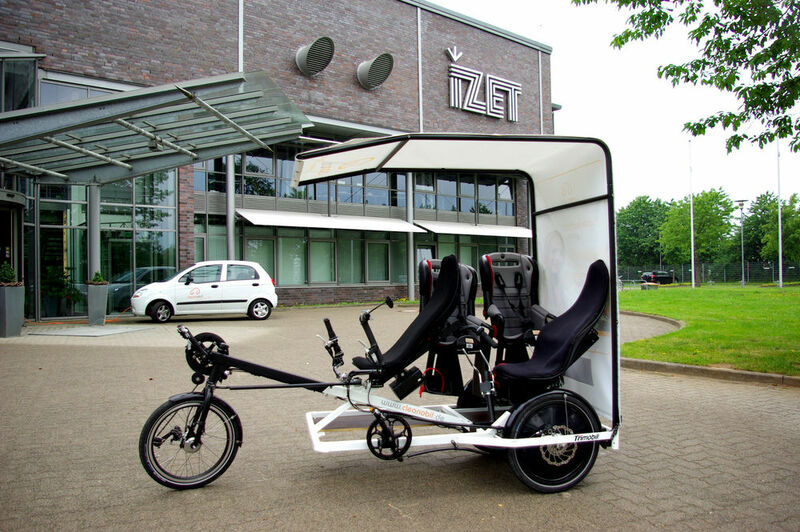 Sustainable mobility with likeability factor: experience the new Trimobil tricycle. 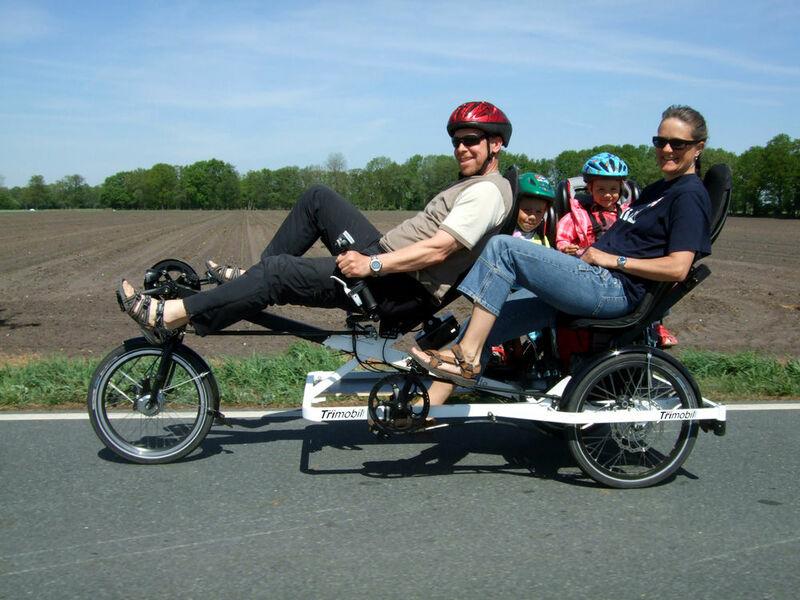 As a velo-taxi, bicycle rickshaw, cargo trike or family tandem, the Trimobil works best in any operation. 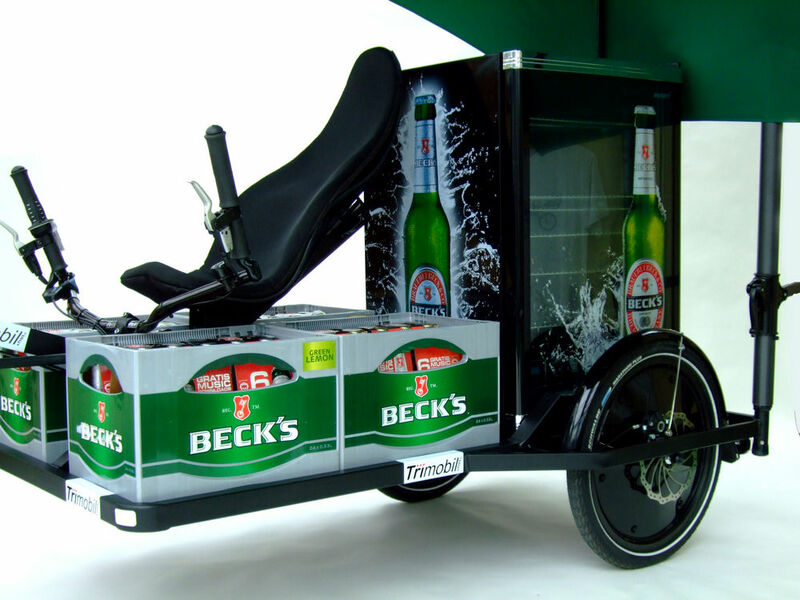 Also as a highly effective marketing and promotional bike for mobile outdoor advertising and an industry cargo bike, it offers up to 5 square meters of advertising space and a durable frame for up to 300kg payload, e.g. as a endig machine or mobile marketing display. 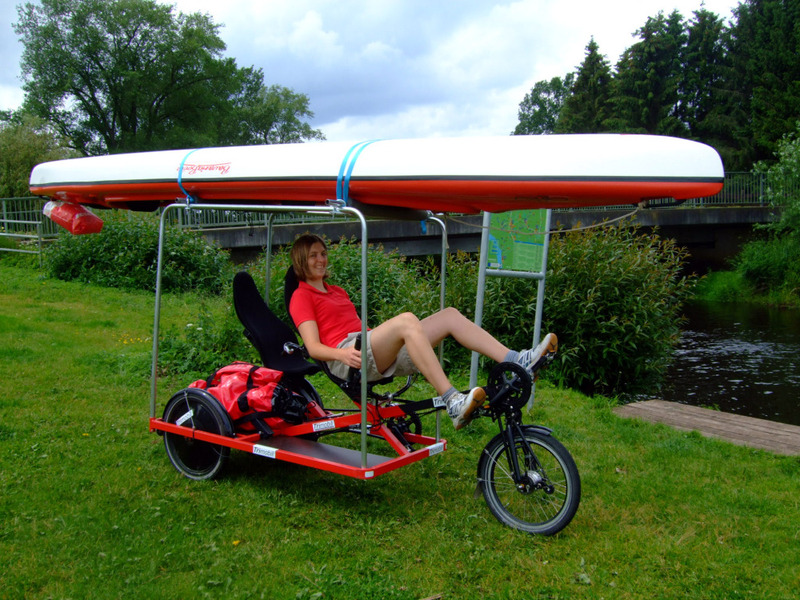 With it`s wide range of options, the Trimobil is also perferct for cycling tours, also with disabled or blind person for their rehab, therapy & sports. 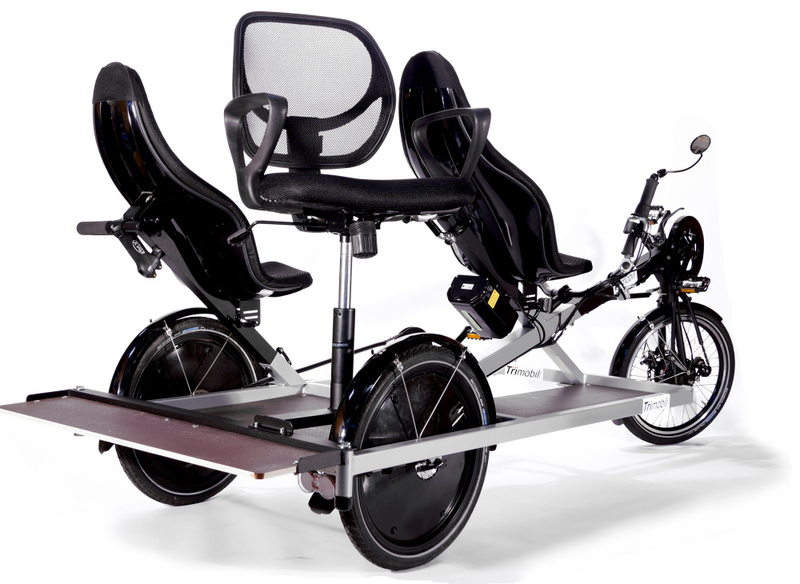 For tourism and bike rental, the Trimobil is also available as a pedelec with 2+2 option and baby trailer. 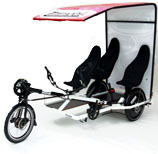 Due to the versatile Trimobil design, the missions are only limited by your imagination. 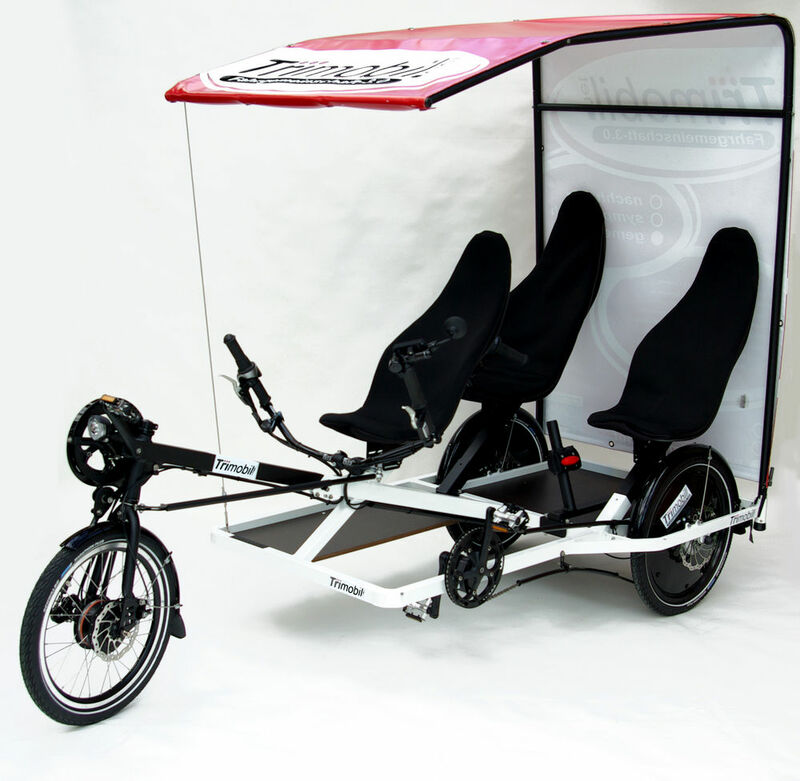 Our Trimobil prototypes triggered incredible enthusiasm at Eurobike show. 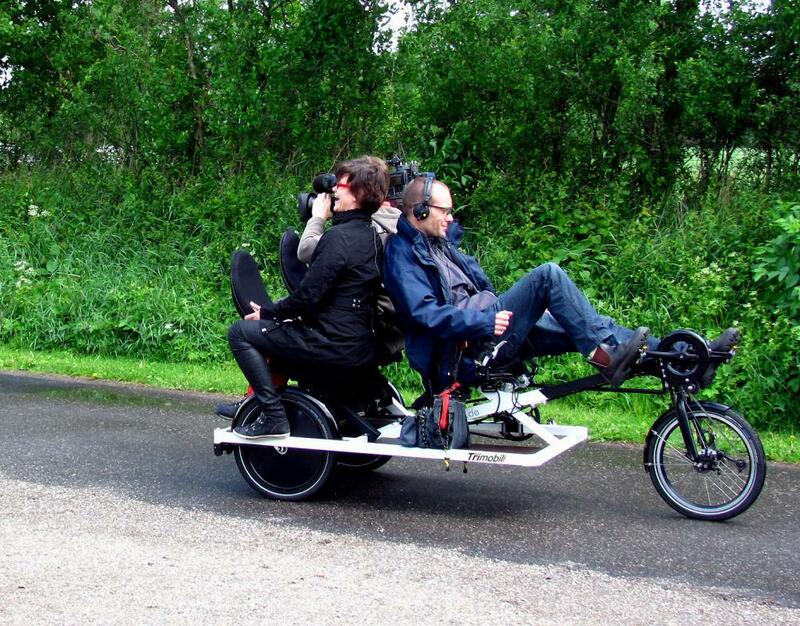 So German TV station ARD turned to Trimobil with its special interest week towards modern human mobility. 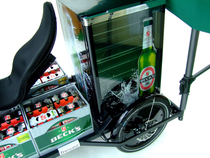 Many print media and other TV reports on the Trimobil were faszinated about the outstanding concept. 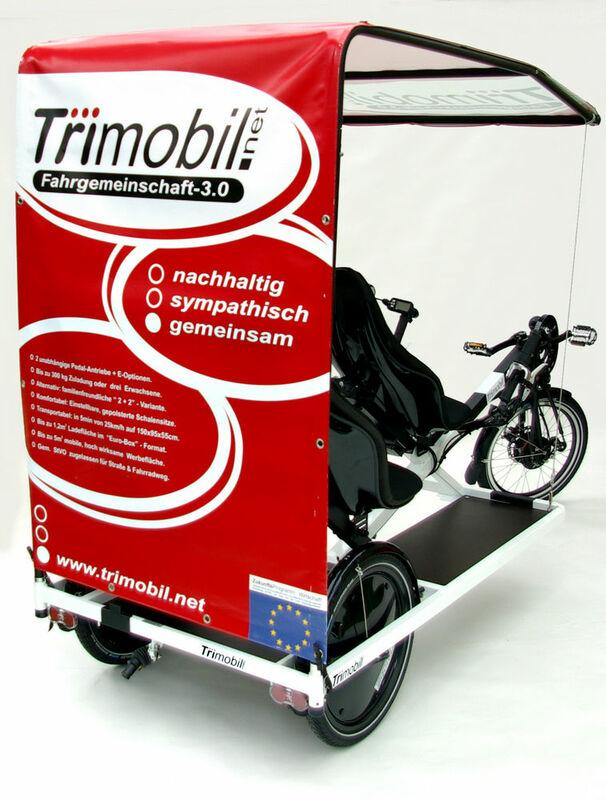 And even German government and EU support our Trimobil project as an environmental friendly innovation in urban mobility. What is that faszinating about Trimobil? 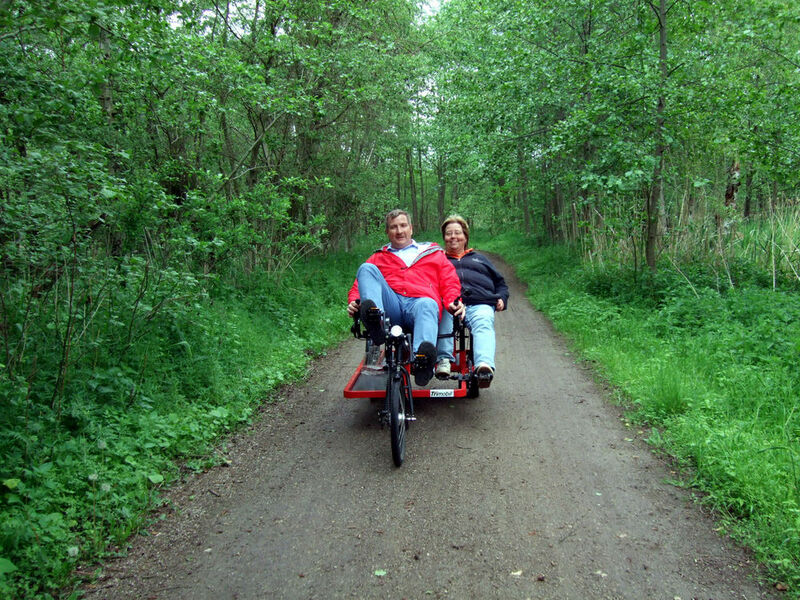 Still a bicycle, compact, quiet and as energy-efficient, it is a versatile, multi purpose vehicle for personal transportation, business and marketing. 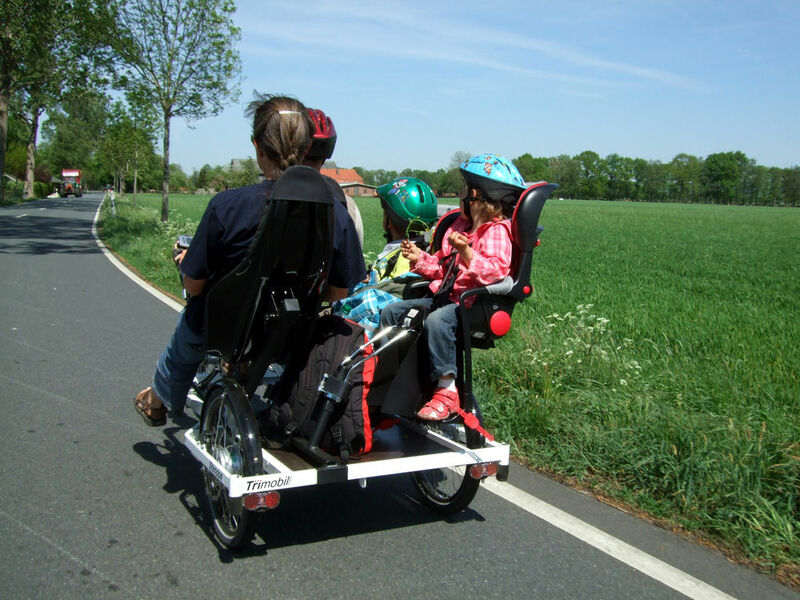 With personal assembly options, besides passengers, your Trimobil also moves loads of all kinds as well as your positive image. 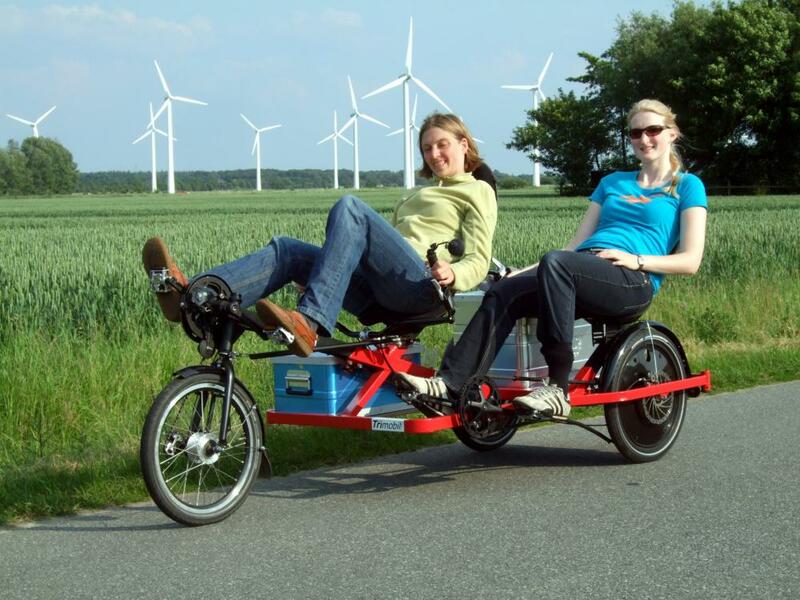 And above all, it is lot of fun to ride your Trimobil, anyway if pilot or passenger: Sustainable, likeable, together. 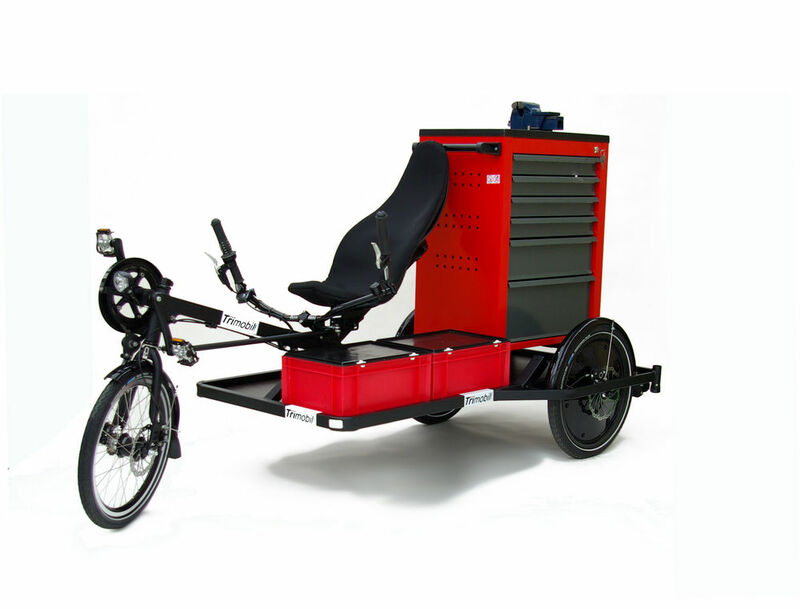 Have a look at our web pages and the online configuration & order tool to get an idea, of which is your favourite Trimobil and how to bring Trimobility into your life and business! 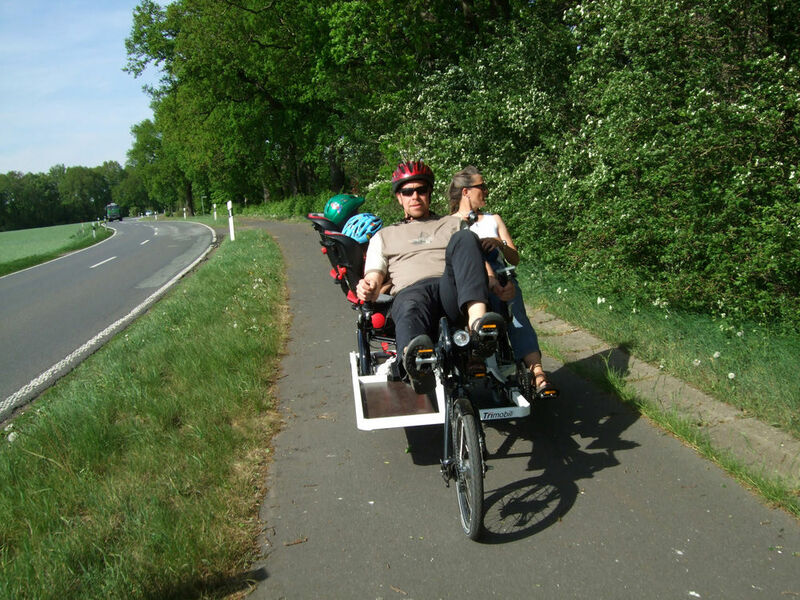 Mit nur 95cm Breite passt das Trimobil auch mit der ganzen Familie auf den Radweg. 1. 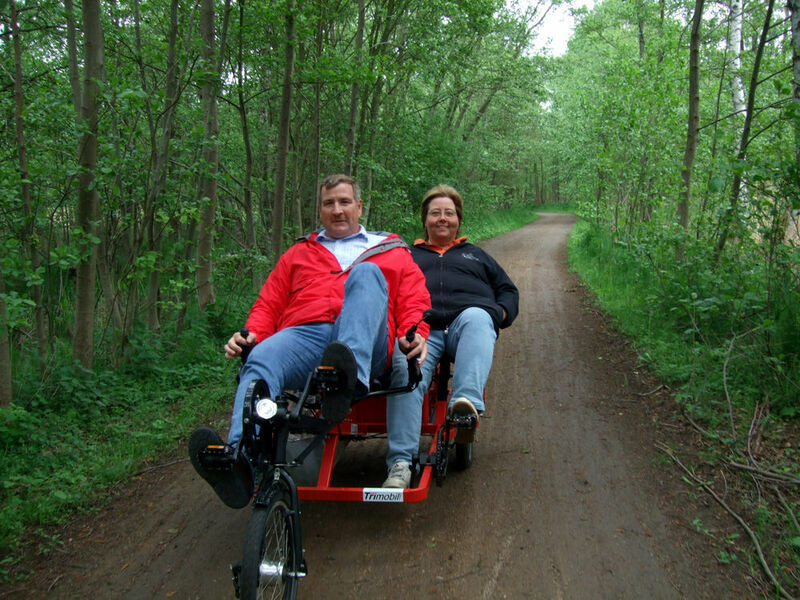 You are looking for a recumbent bike or rehab trike? 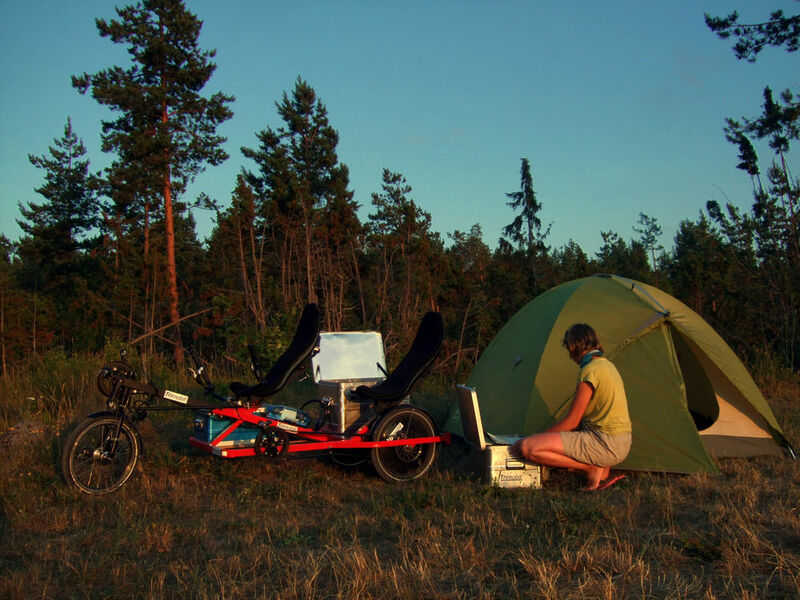 As a special bike manufacturer with our Toxy brand, we have been dedicating to the full suspension recumbent bicycles for 20 years now, which you can use for everyday life, commuting, sports and cycling trips without restriction, compact transport (especially as a practical folding recumbent bike) and just as easy to handle as your upright bicycle. - But much more comfortable. 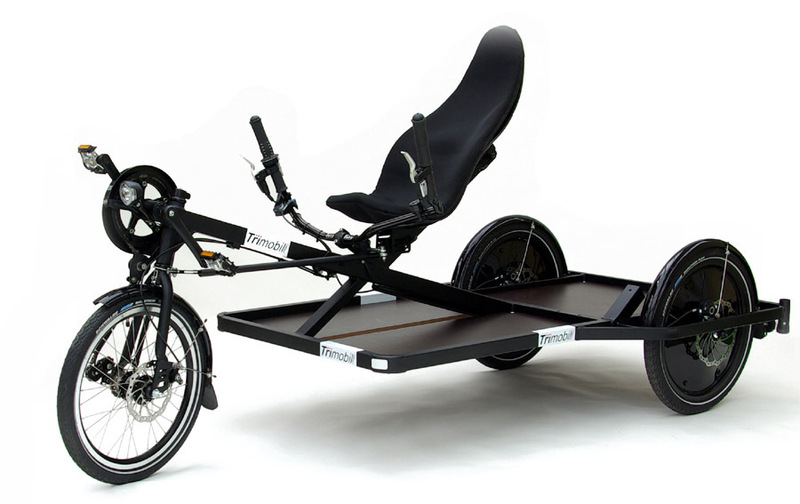 Focussing on riding comfort, our full-suspension recumbent bike models are all now also available as a pedelec (the so-called e-bike). 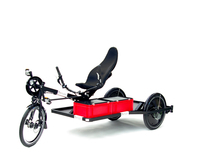 Our recumbent classic Toxy-CL is currently available in the Jubilee design. 2. 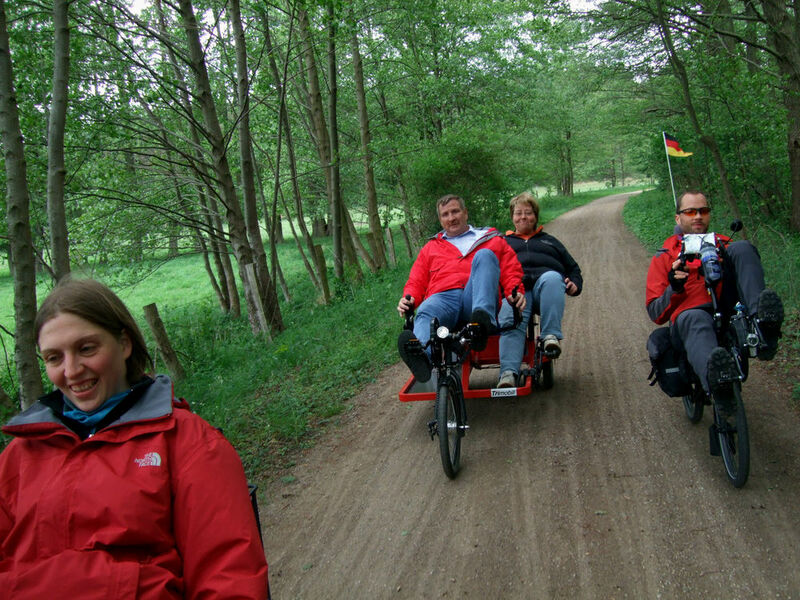 You prefer a tricycle due to health problems or other reasons, we would be pleased to advise you on the special bicycle products of our colleagues from HP Velotechnik, Ice Trike, AnthroTech and Hase Bikes with appropriate offers for therapy and rehabilitation. 3. 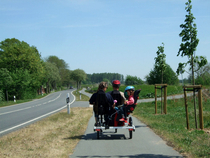 Further more, we have developed the Trimobil Trike for many other needs & requirements: A multi purpose vehicle. 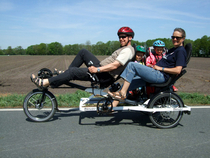 You are looking for a family tricycle, kindergarten-taxi or family tandem with 2 plus 2 option? 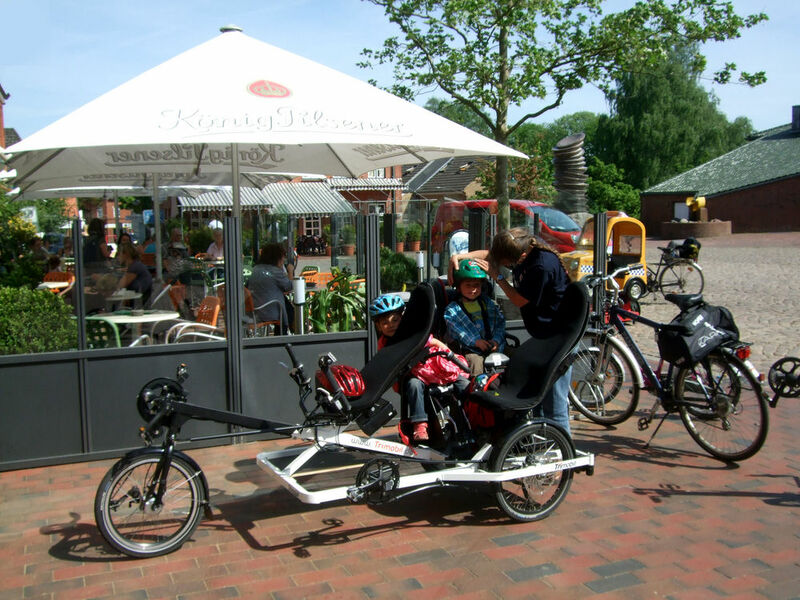 - We offer comfortable seats on the Trimobil up to four small children (-> kindergarten taxi), a powerful pedelec or e-bike drive and up to two independent pedal drives. 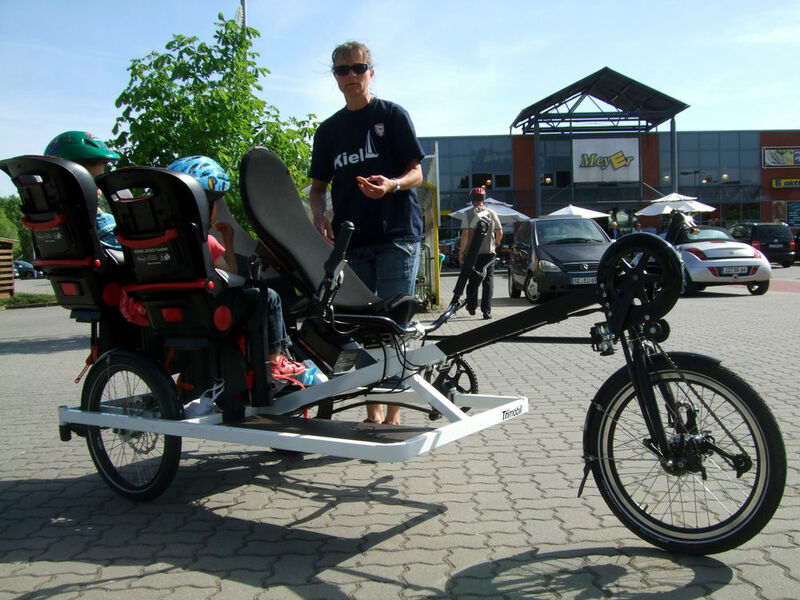 In addition, a coupling attachment for bicycle trailers or children trailers such as Croozer, Thule, Chariot, Weber and others is standard. 4. 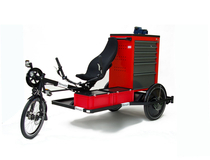 Do you need a cargo bike (cargo trike or tricycle), a modern bicycle rickshaw or a velo taxi for rickshaw service or an industrial bike, transport bike or delivery vehicle for your company? - All options are already prepared by the modular equipment system, from universal transport systems for the "last mile" and stacking boxes up to the weather protection. 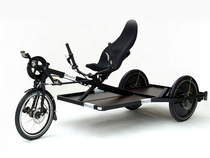 Just configure your Cargo Trike online in our comfortable web configurators. 5. We are more than happy to provide individual solutions, such as collection containers or transport attachments (for example as a municipal vehicle). 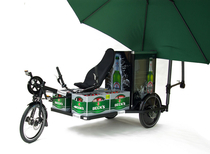 Special solutions offer perfect opportunities for the Trimobil as promotional bike and effective advertising vehicle (advertising bike) for marketing & PR with sympathy factor. 6. 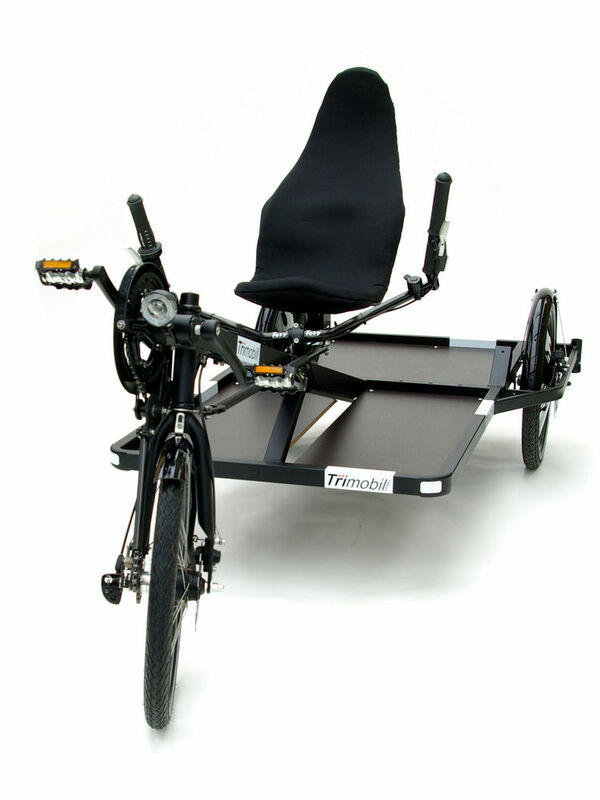 Versatile equipment options make the Trimobil an ideal rehab bike / safe therapy tricycle with a comfortable reclining or reclining seat position for rehabilitation and integrative facilities as well as an exceptional rental bike or rental pedelec in tourist locations. 7. 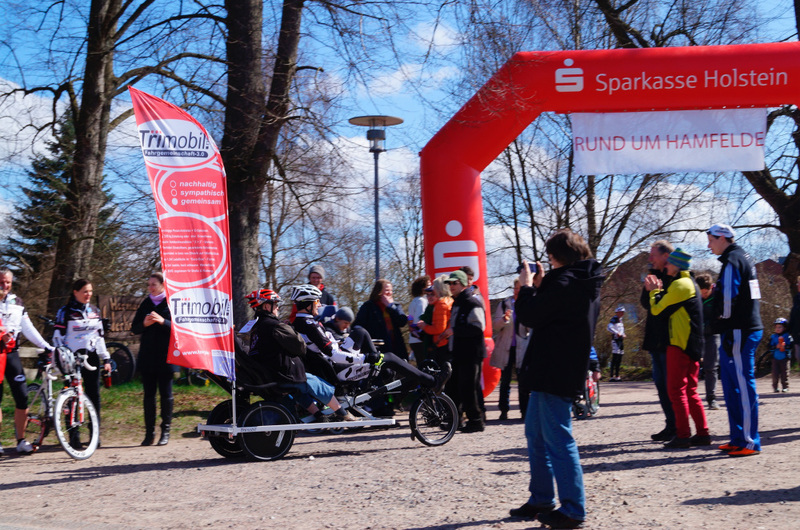 Trimobil rental stations are currently located near Hamburg, Berlin, the Flaeming-Skate and the Allgäu. 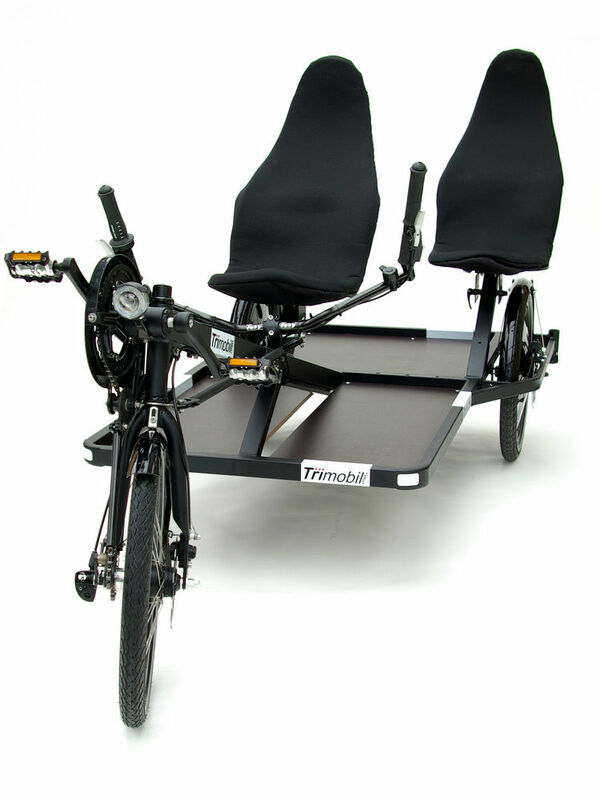 Here you can rent Trimobile e.g. 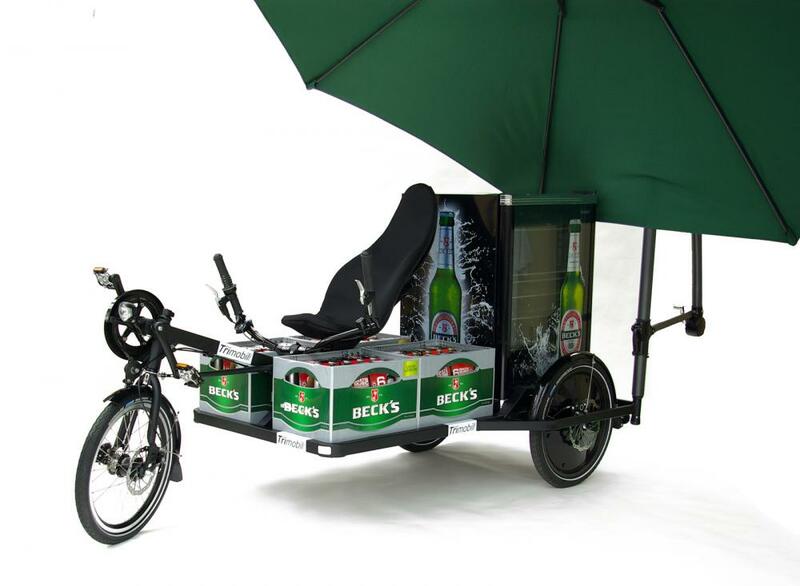 for weddings (wedding rickshaw), family celebrations, anniversaries, promotions and corporate events. 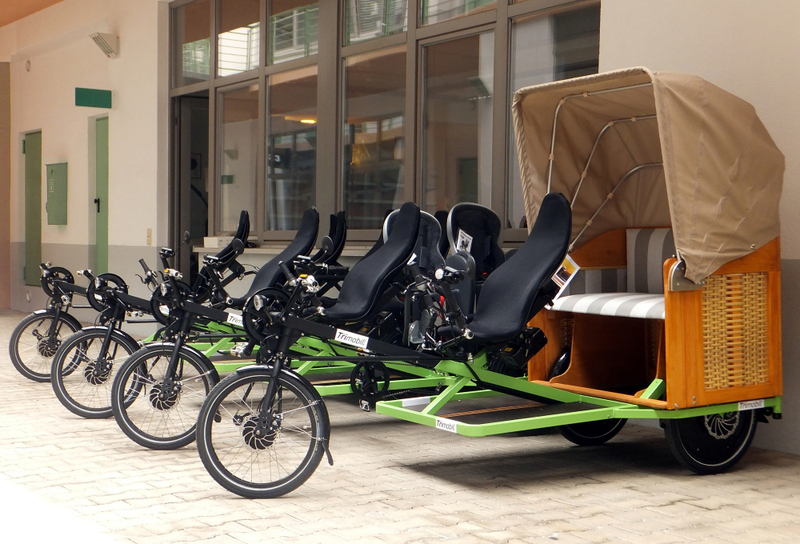 For the extpansion of this test drive and rental system, we are looking forward to inquiries from interested parties for the rickshaw rental from the regions of Vienna, Innsbruck, Copenhagen, Amsterdam, Berne, Zurich, Paris, Madrid, Lisboa, Porto, Canary Islands, Helsinki, Stockholm, London, Dublin, Sydney, New York, Boston, San Francisco and various cities and holiday destinations all over the world. We are looking forward to hearing from you, we are happy to advise you and offer the right Trimobile also to our bike-leasing conditions. 8. Maintenance-friendly bicycle technology and the comfortable ergonomics of the Trimobil are based on 20 years of experience of Toxy Liegerad GmbH in special bicycle construction made in Germany. 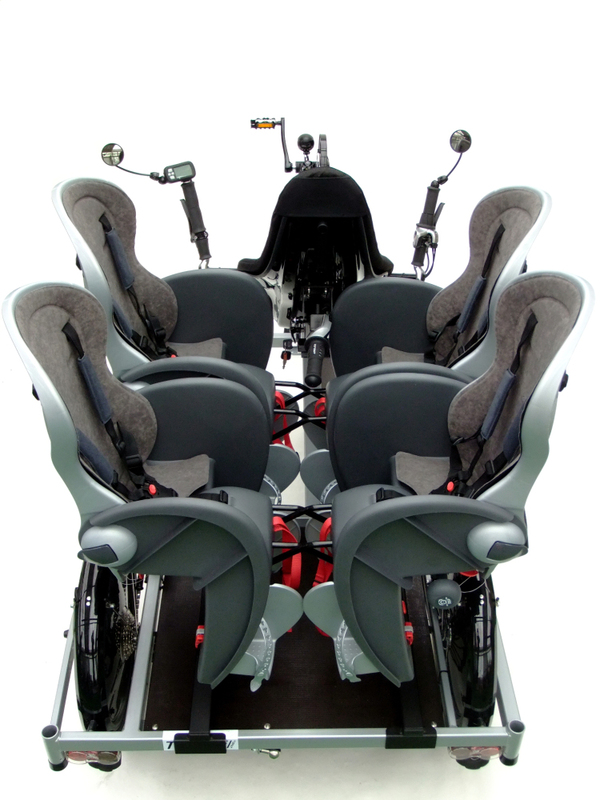 Professional ergonomic reclining seats with comfort cushions ensure pedeling efficiency and comfort also on bike trips and on bicycle holidays. Hydraulic Magura MT disc brakes with 203mm brake discs, busch + muller diode headlights and two LED rear lamps with parking light function, Shimano hub dynamo, "unflatable" Schwalbe Marathon plus tires, special SKS muguards and parking brake are already standard. "SRAM" (iMotion T3 and DualDrive transmission), Nuvinci (stepless transmission hub N360), Shimano (Nexus 7-speed hub or Deore chain shift) or the legendary Rohloff Speedhub 500/14 are available for the smooth drive. All these components ensure excellent cycling pleasure and the maintenance options at every modern bicycle workshop of your choice. 9. Visit us at a desired date or for a whole relaxing recumbent experience weekend for a detailed consultation with an impressive test ride on one of the nearby cycle paths through the Holsteiner Auenland north of Hamburg. 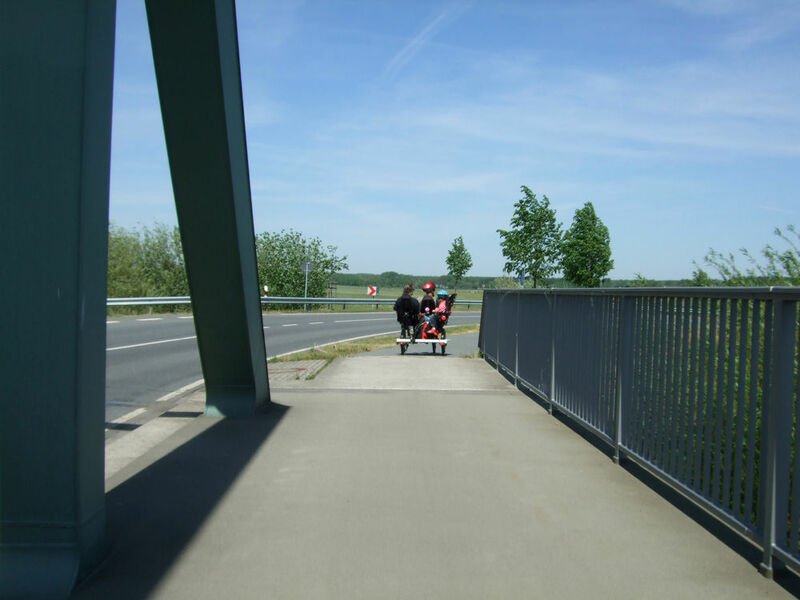 On low-traffic roads, cycle tracks or forest paths, test your favorite model and order it individually according to your personal needs and preferences. 10. 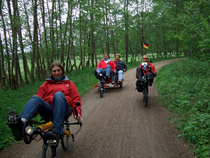 Also visit us in the web any time at our informative sites (www.toxy.de & www.trimobil.net) as well as our recumbent bike webshop and configuration tools, where you can choose and order your individually customized Toxy bike or Trimobil Trike according to your personal wishes & requirements. Worldwide delivery to most countries.